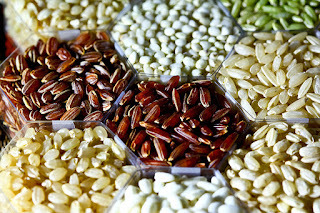 From Roses to Rainbows: Rice: Brown, White or Other? Rice: Brown, White or Other? Rice, as we know it, was domesticated from Oryza Rufipogon some 10,000 to 14,000 years ago and has been eaten by people all over the world. Rice was first grown in California back in the gold rush days, and it is one the top rice producers in the U.S. The question on our minds today is this: What is the best rice? There is no right answer because there are multiple types and varieties. Let's break it down and take a closer look at one of the most common foods on earth, found in almost all cuisines. Long-grain, which is the most common, it cooks up fluffy and stays separated. It is about four times as long as it is wide. Medium-grain is tender, moist and chewy. It is twice as long as it is wide. Short-grain rice is short and plump, sticks together and clumps when cooked. Each size has it's own characteristics and dishes for which it is best suited. There are many varieties of rice, which come in one or more of the sizes discussed above. White Rice. Most common is the standard white rice, which has been milled to remove the husk and then polished to remove any remaining bran. This has fewer nutrients than the other types. It is, however, very versatile and great for everyday dishes with meat, chicken and veggies, and also as part of a salad. Brown Rice. Brown rice comes in both short and long grain sizes and is milled to remove the husk, but the bran layer remains. It has a chewy texture and a nutty flavor. It is very nutritious, and you can substitute brown rice for any recipe made with white rice. Brown rice does take longer to cook than white rice. Parboiled Rice. Parboiled rice is the product of rice that has been soaked, steamed and dried. During this process, the nutrients from the husk are absorbed into the grain, making it more healthy than standard white rice. The starch content is altered, and the lower starch content means it is less sticky than white rice, and particularly well-suited for thick curries. Arborio is used mainly for risotto and absorbs liquid and flavors from slow cooking. Basmati, a long-grain rice from India, is very fragrant and full flavored. This comes from aging for one year after harvest. Basmati is often served with curries. Black Rice, once known as "forbidden rice" or "emperor's rice" is high in antioxidents. It is a medium-grain rice frequently used in Asian cuisines. It is also nutritionally even more impressive than brown rice. Jasmine is a long-grain, slightly sticky rice that pairs well with curry or Jamaican Jerk Chicken. Sushi Rice comes in white or brown and is a Japanese short-grain. It's high starch content gives it the stickiness needed to make sushi. Now that we have covered the styles and some of the varieties, what should we use for our go-to rice? While brown rice has more calories, protein, carbs, fiber, sodium, sugars and fat than white rice, it also is rich in magnesium, selenium, phosphorus, B vitamins, copper, zinc, iron, calcium and potassium. There are differing opinions on the brown vs. white question, but based on it's nutrition analysis, brown rice is certainly a good choice. It is healthy, versatile and delicious. Brown rice does require more liquid and needs longer to cook (at least twice as long as white rice). Also, because of it's higher fat content, it does not keep as long as white rice. White rice has had the husk and all bran removed, so it is basically stripped of many of its nutrients. It is lower in calories and fat content and has more iron and calcium than brown rice. A negative is that it has a higher glycemic index than brown rice. Which brings me to parboiled rice, and my rice of choice for everyday cooking. What is the nutritional difference? Compared to standard white rice, parboiled rice has more fiber (double that of white rice), calcium, potassium, B6, niacin, magnesium, iron, zinc and more. Here is some good news for diabetics; parboiled rice, like brown rice, has a lower glycemic index than white rice. The best rices for everyday use are brown, parboiled and white. For specialty dishes or cuisines, choose the best rice for the dish based on it's type and characteristics. What is your rice of choice for every day? What is your favorite specialty rice or rice dish?